I've been lusting over holographic bags and shoes the entire summer. I even googled out every possible way with the word holographic and thankfully Asos came out with hologram bag on same time. Still searching for same shoes, I asked my boyfriend to custom paint my phone in holographic glitters. 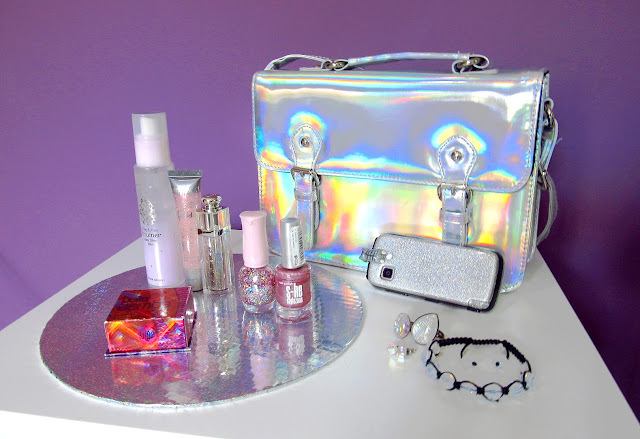 I even realised I already had some jewelery and make up items related to holographic trend. Do I need to say they are a great conversation starters? I think I'm pretty much settled with holographic items (still searching for shoes though). You can also check out my DIY holographic perfume display here. Do you find holographic items interesting? What's your favourite thing/accessory to wear in the summer? this bag is out of my mind!!! stunning!